If you are here for the first time, welcome to Mountain Breaths. 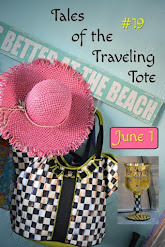 Today I am joining a group of talented bloggers to bring you our quarterly Tales of the Traveling Tote. 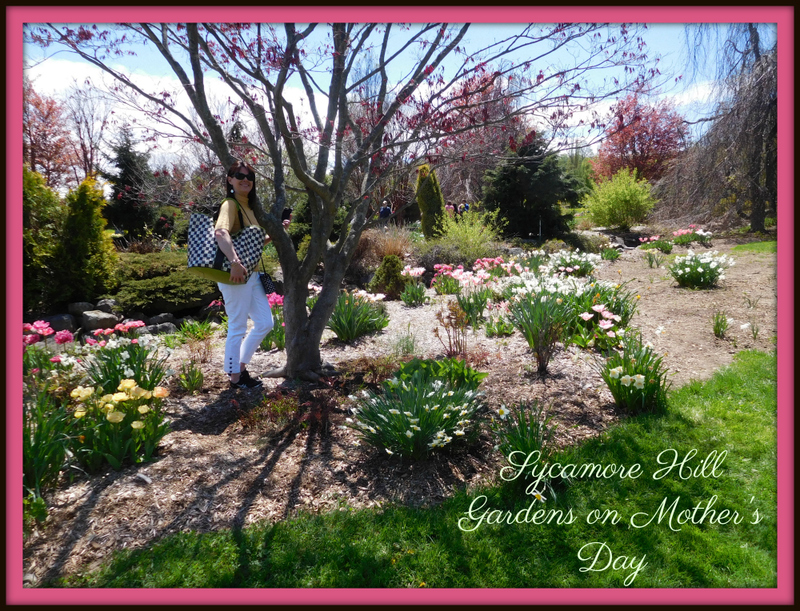 Before we start the Farmhouse Tour, Miss Aurora enjoyed the flowering trees in spring at Sycamore Hill Gardens in Marcellus, NY on Mother's Day. We have gone for the last four years, and each year we invite someone from the family to join us. This year it was my sister Diane and niece Chelsea and we all loved it. 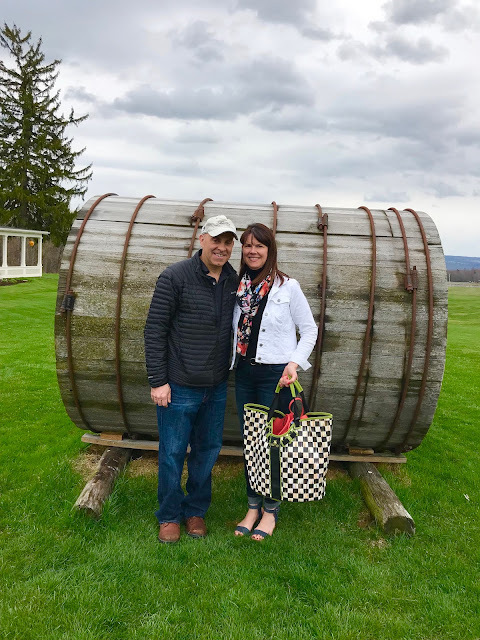 My husband and I took a quick trip to Beekman 1802 Mercantile in Sharon Springs just before Mother's Day to stock up on Happy Place laundry detergent and goat milk soap. I loved the wicker picnic tote and the bed of ferns! 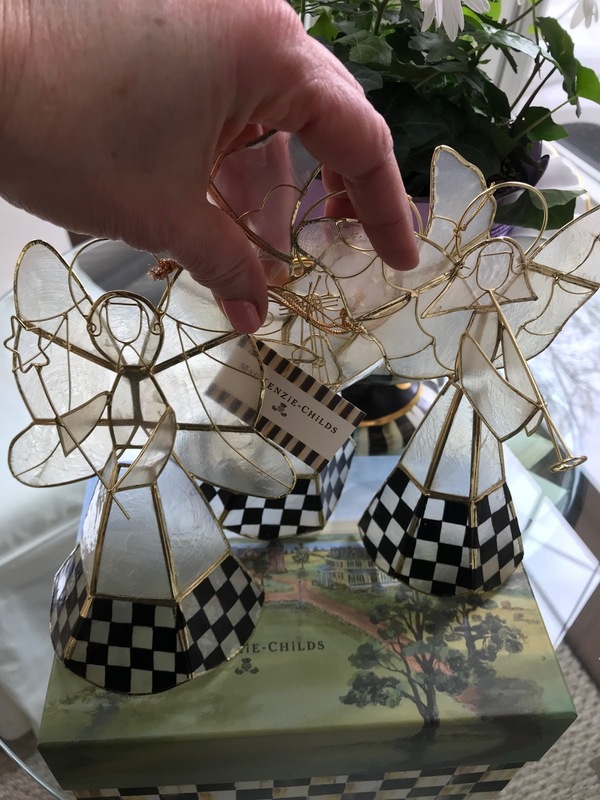 Miss Aurora was very content traveling locally so in April, Joe and I attended the MacKenzie-Childs Warehouse Sale in Union Springs and added a few items to our collection. Then we headed to the lovely Farmhouse on Cayuga Lake for a tour. 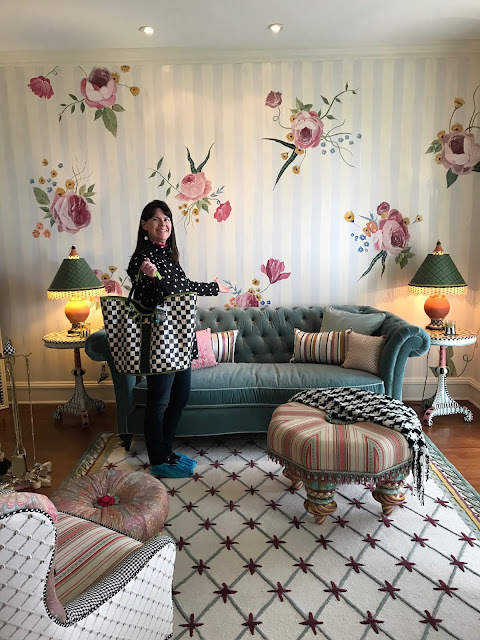 On the farmhouse tour, we started in the living room (parlor) that was under renovation. Artist "Corey" from the Visuals team had finished the walls of the farmhouse, one bouquet at a time. 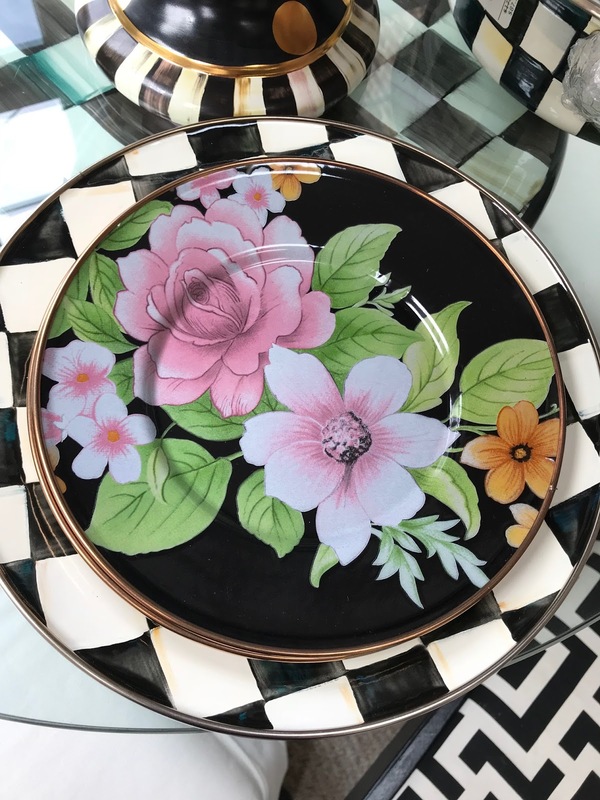 Hand-painted flowers on tone on tone stripes. This is the new look. 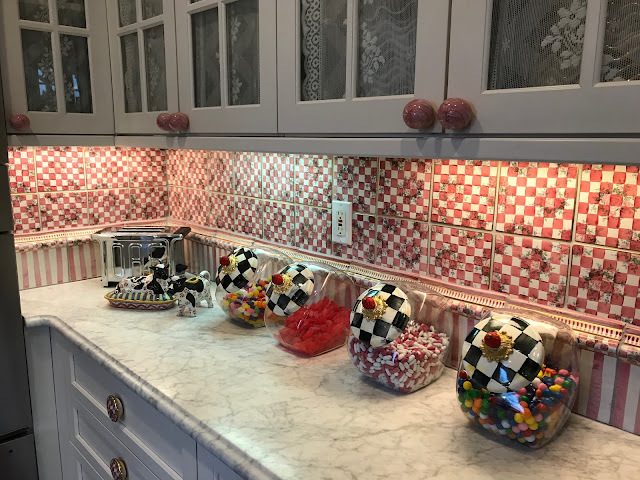 Below is a photo I took of the same room in the fall. A big change! The 3,300-square-foot, three-story Farmhouse is an example of classic Second Empire/mansard architecture, which was popular from 1860 to 1900, particularly in the Northeast. It shows many features of that style, including a mansard roof, decorative dormer windows, and porches with columns. 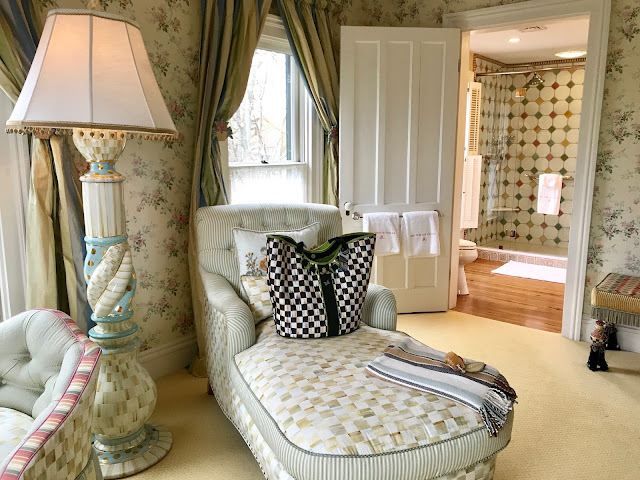 Its interior was remodeled extensively in the early 2000s, but some of its original charming features remain, including the front doors and several sets of pocket doors believed to be black walnut. Here are a couple photos that I took last the summer and you can see the mansard roof and porch with columns. Miss Aurora posting on the new living room rug at the Farmhouse. 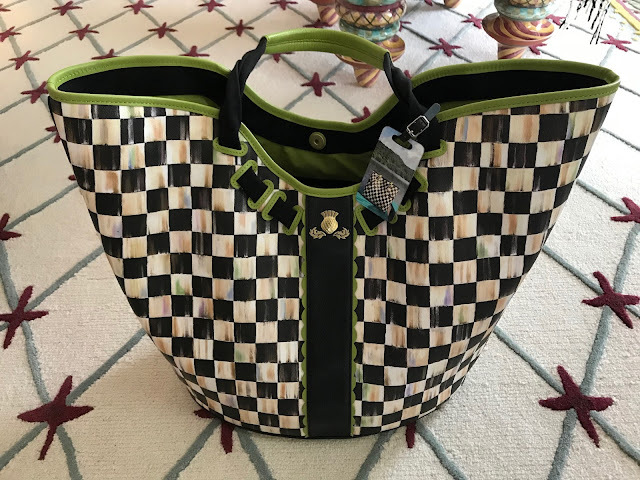 Much to my surprise, we saw a woman with "The Tote" and we conversed and determined that the twin sisters were from California and visiting NY to attend the warehouse sale. It was a pleasure meeting Dot and Donna and having our picture taken with Tom. (a wonderful long time MKC employee that you will see at the barn sale if you attend). Here's a few of the items we purchased at the MKC Warehouse Sale in April. A lone sleigh ornament which Joe quickly grabbed from the employee that was pricing it. I stash these items away, and it's like Christmas once I dig through the bag again in November. In the photo below, that is me pushing the cart in one of the rooms at the warehouse sale. At the end of April, we attended the Herb and Wine Festival on Cayuga Lake. 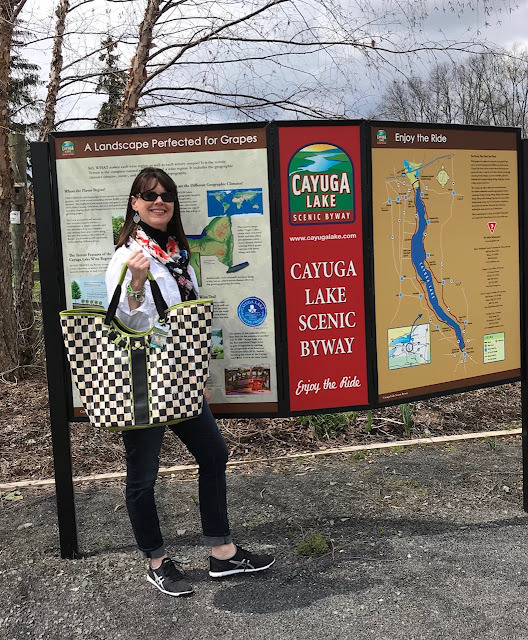 For those of you who don't know the area, MacKenzie-Childs is located on Cayuga Lake, however we didn't have time to visit on this trip. Our spring blooms are late this year, so only the daffodils were blooming. I've included a picture from last year when the tulips were in bloom at the same time of the year. Yes, I am cold! It started out "warmish" and then the clouds started rolling in and rained. Hope you enjoyed the tour! This was my 15th Traveling Tote post. Miss Aurora definitely gets around, and I had several compliments on "her" when I visited the retail store and had to explain that she is retired but may possibly be found on Ebay. 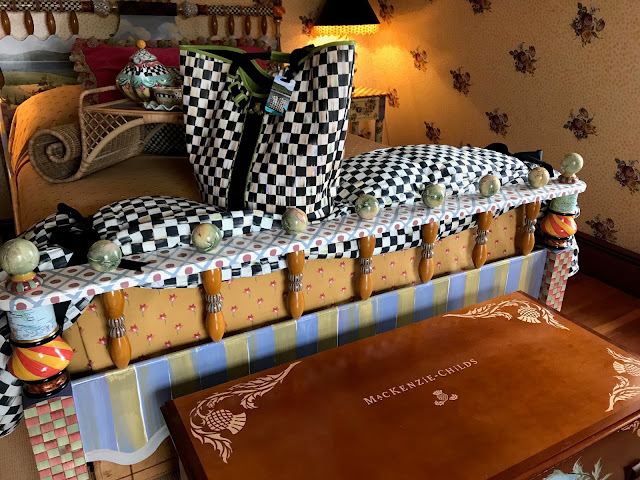 The common thread of MacKenzie-Childs has started many conversations. 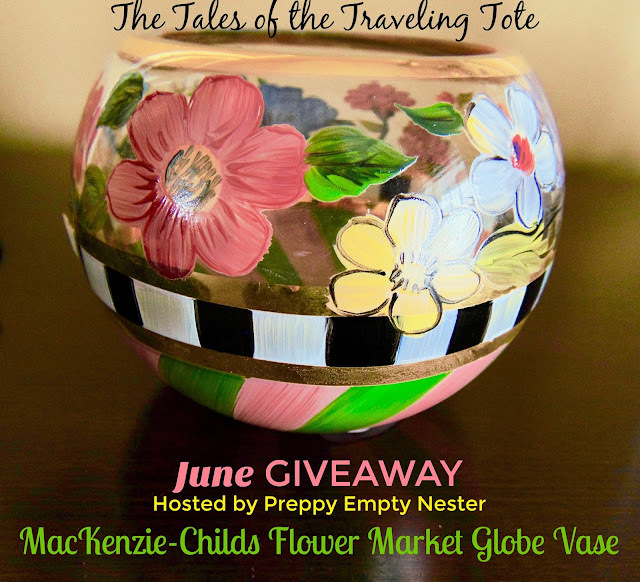 We are offering the lovely Flower Market Globe Vase as a giveaway to our loyal readers. 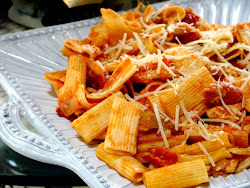 All you have to do it visit Katie with Miss Daisy @ Preppy Empty Nester. Let them know you would like to be included in the drawing for the vase. It looks so sweet with flowers! My friend Tami (who doesn't blog) shared this great photo on Facebook when she was in Cape May. 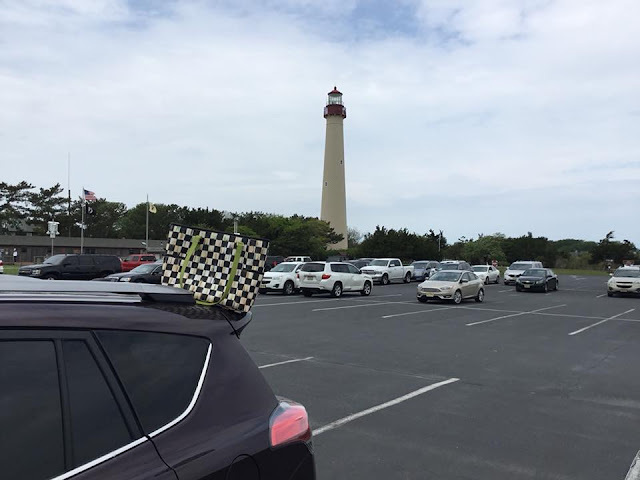 Love how these totes get around! Debbie...What a perfectly delightful post. I would love to go to a MC warehouse sale. That farmhouse is positively darling! The Herb and Wine Festival looks like so much fun and right up my alley! Thanks for the virtual tour. Enjoy your weekend!! Thanks Katie! 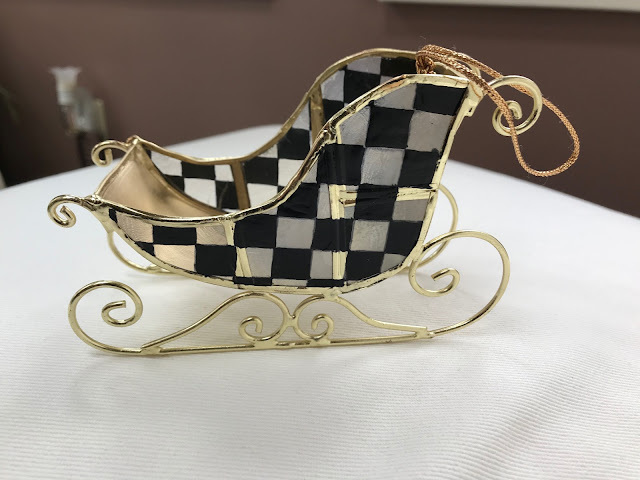 The MC warehouse sale is very subdued in comparison to the barn sale, and you never know what you will find. Have a great weekend. Your visits to the "Mother" and other are fun and colorful, Debbie. That parchment chaise in the MBR is calling my name! I'd love to go to the warehouse sale (less hoopla and crowd than the barn sale). The new design in the LR reminds me of Dorothy Draper styling with those oversized florals on the walls. That Beekman bed looks so fun! And that cute picnic tote looks like it could be used as a purse! I agree with you that our totes always seem to strike up a conversation, sometimes from the most surprising people in some surprising places! Super fun, always. The video didn't work for me but there is so much to seeon this post it is fine:) Love your boots..your white jean jacket:) Joe is such a good sport..Neat purchases..
You and your tote (and Joe!) 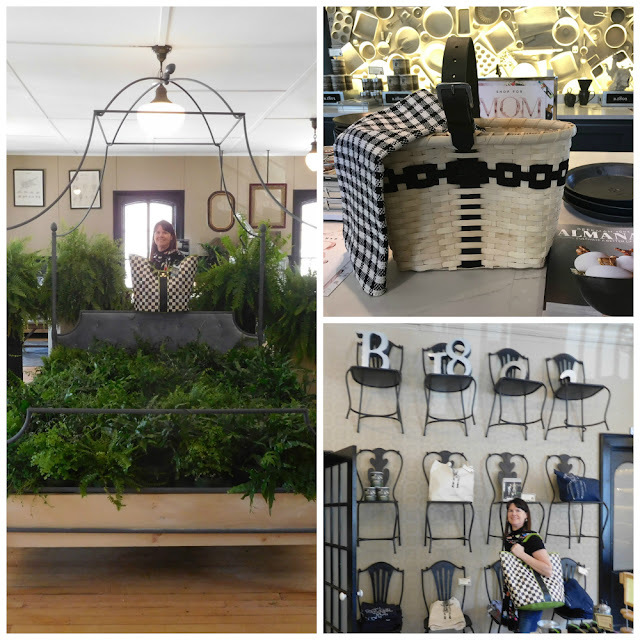 have certainly been busy this spring....I always love peeking into the Farmhouse! Great goodies you got at the Sale! Love the little spreader knives! I always forget to use my FM ones! 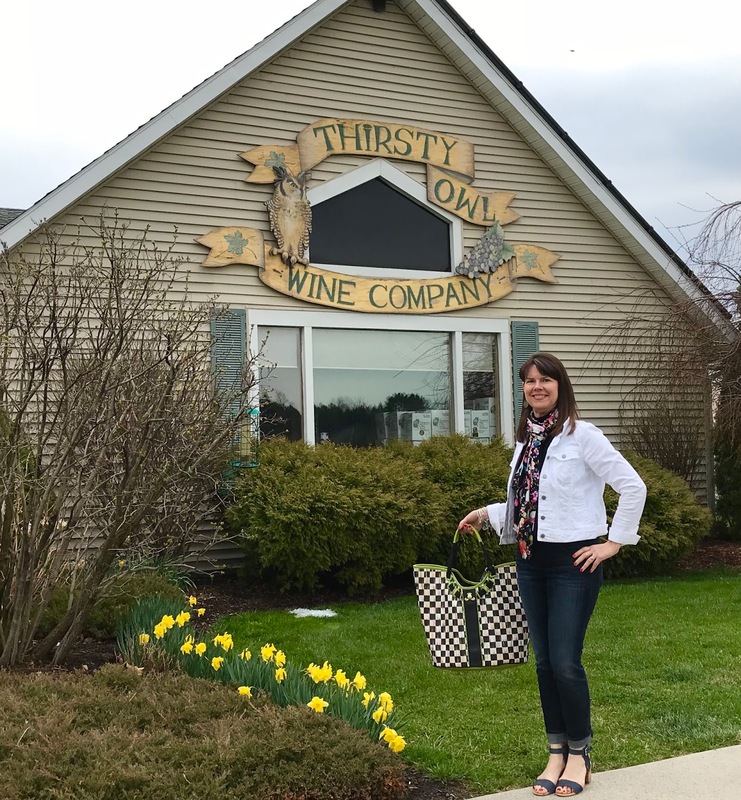 The Finger Lakes wineries are always fun! We should try the herb trail with you some time! Happy Summer!!! Wow, Miss Aurora sure made herself comfortable at the Farmhouse. I love your before and after with the newly painted walls. What a magnificent wall treatment. 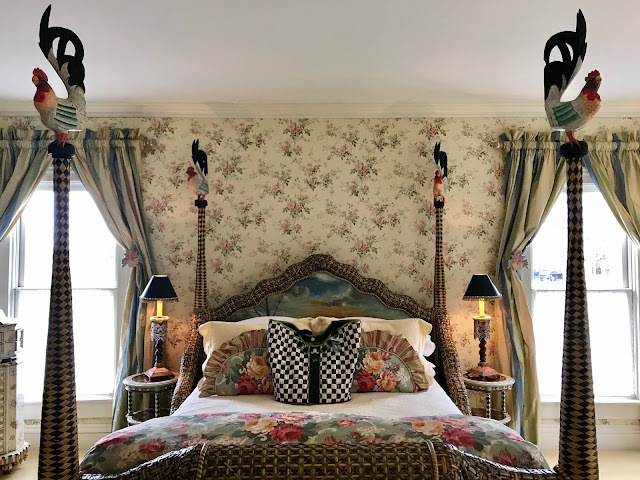 Every room was such a delight and I just wanted to be there with you! Your finds were great. It looks like maybe that isn't as crazy a time of year to go too. Maybe I should try and make it to the warehouse sale next year. You always look so classy with Miss Aurora - I can see why people stop and ask about you both! Thanks for taking us along. Please include me in the drawing! I've enjoyed the Travels of Tote! Oh, my, the MC store was great in NYC but this MC sale looks like the "be all, do all." I thoroughly enjoyed hearing about your travels and seeing all the beautiful pics. Happy weekend! 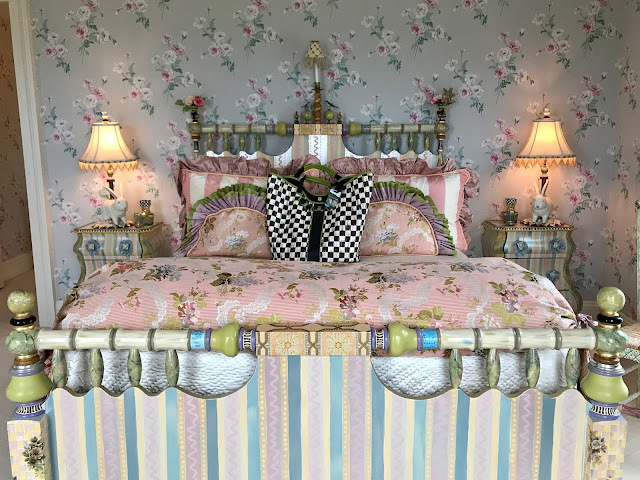 Debbie, I never tire of seeing the special rooms and furnishings of the MKC farm house. You got some great shots! I like to study every detail! Glad you and Miss Aurora have had a full and eventful spring. You two have been busy! Thanks for sharing your adventures. Wow, #15. 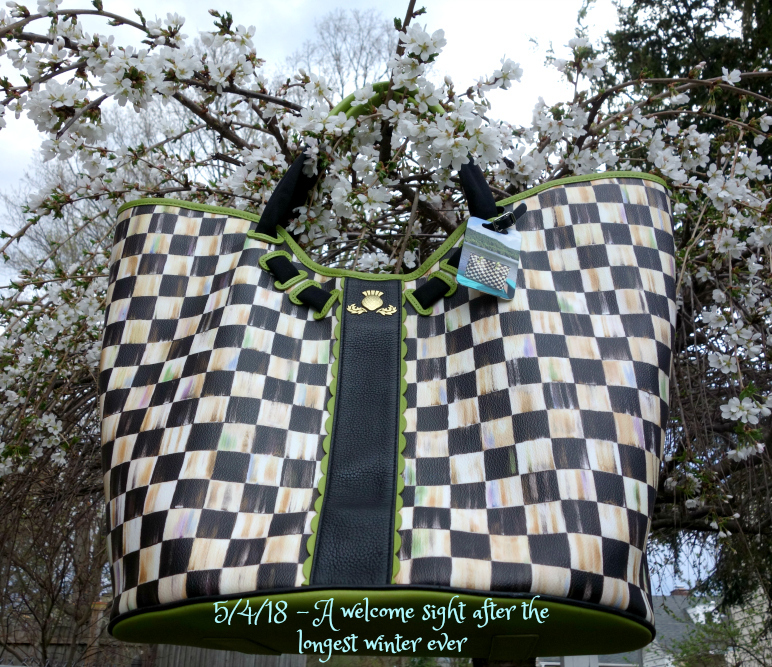 It's hard to believe we have been sharing our tote travels this long. Looking forward to sharing the Barn Sale eperience with you this summer. I'm counting down the days!!! 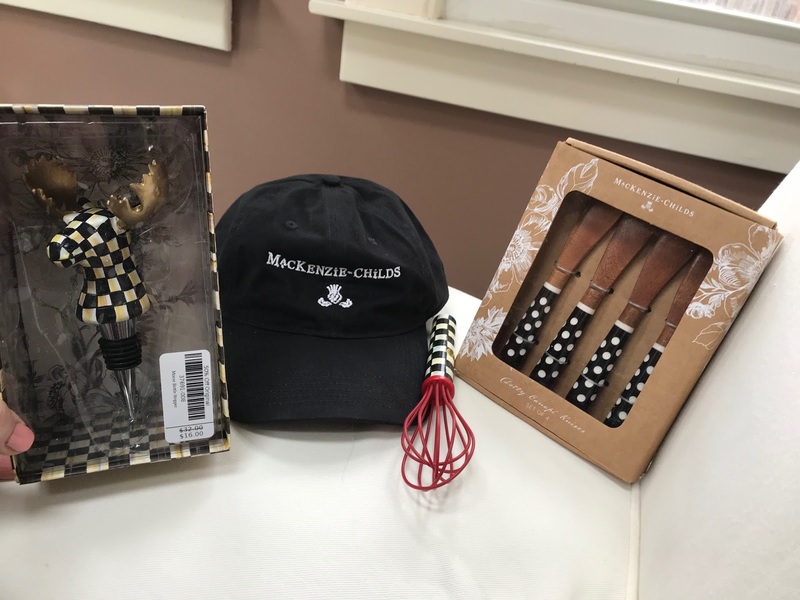 Great job of shopping at the MC warehouse sale, I like the little knives. Miss Aurora looked right at home at the farmhouse. Debbie, this looks like so much fun! 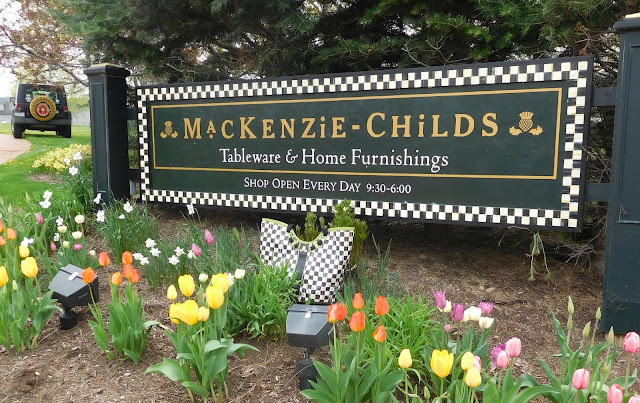 I was lucky to visit the MacKenzie-Childs farm once a few years ago. I haven't been in that house though. Your pictures all make me want to go! You girls are all so cute with your bags and I think the connection is the sweetest thing! Oh Debbie,I can't imagine touring the farmhouse, MKC on steroids, wowza!! I can't believe you could just wander around like it was your own, and take all those dreamy photos! 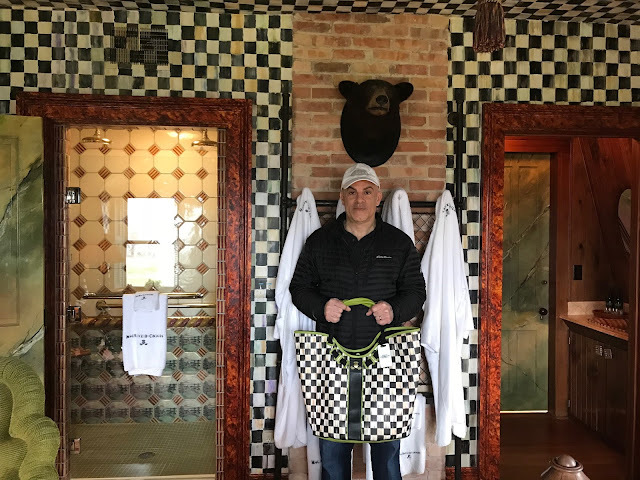 Your Joe is so cute posing with your tote and incredible that he is as much an MKC fan as you are! You are so lucky to be able to hit the sales, how do you ever decide what to buy? I love what you chose, so many temptations! You and Miss Aurora are adorable, I am sure you will have many more adventures this summer! I can never get enough of the Farm House! Love the tote’s name! 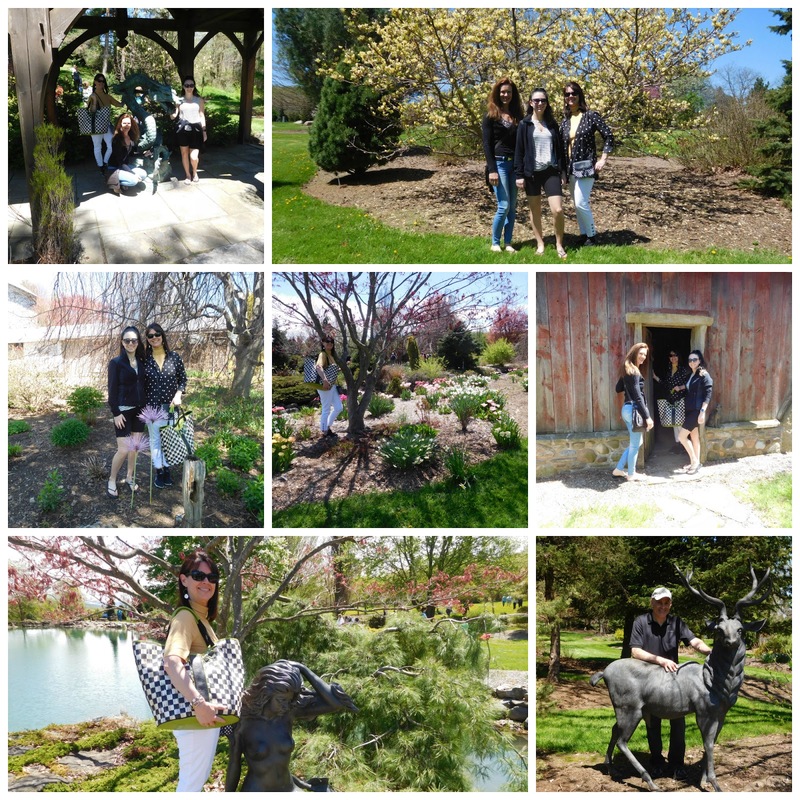 Beautiful pictures ~ Thanks for sharing! 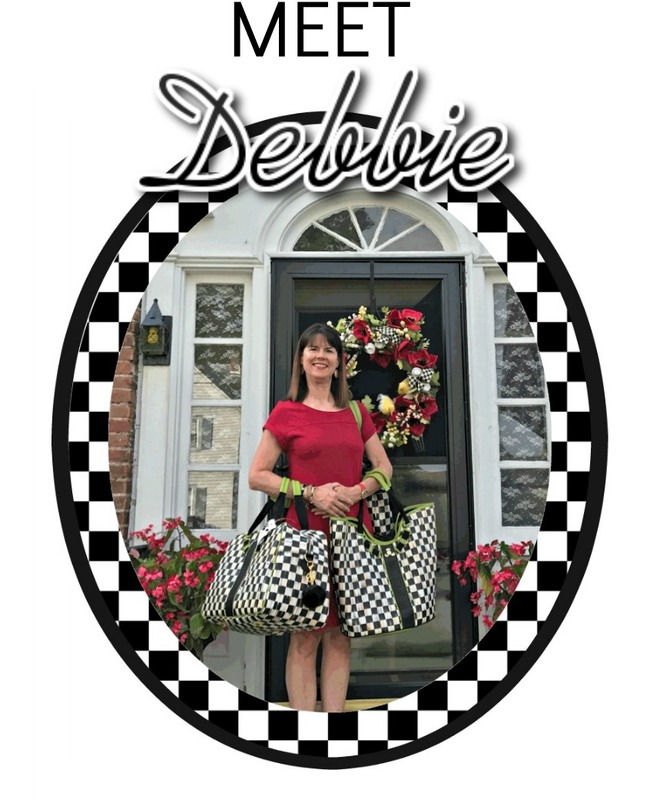 What a fun time I had touring the delightful farmhouse, Debbie! I was oohing and ahhing at each bedroom, bathroom, candy jars, and the parlor with the pretty handpainted wallpaper. I also loved seeing you, with your sister and niece, and of course, Joe, your loving and supportive companion. 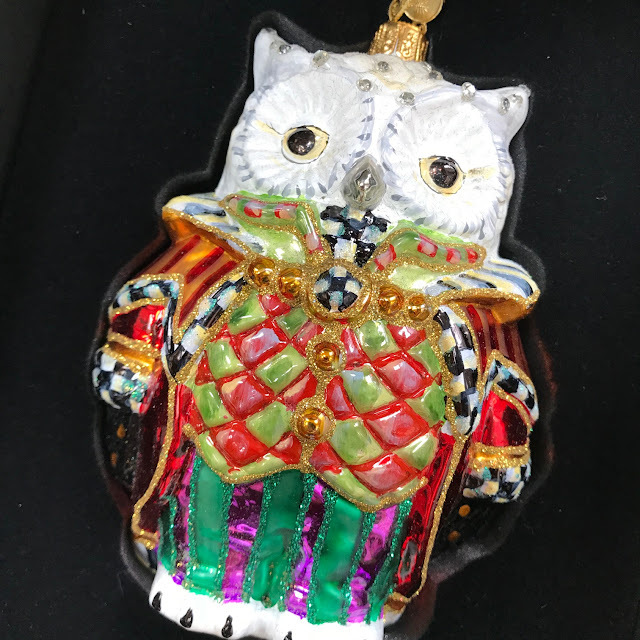 You bought some lovely treasures, and I look forward to seeing them in future posts! 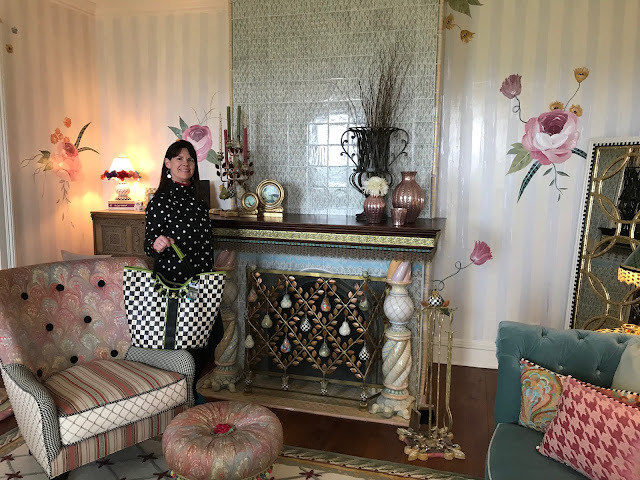 I loved the hand painted flowers in the living room. I should try something like that in our home. I have to watch Joe very closely with that camera :-) You have no idea how many pictures I end up in as he is so quick and sneaky.